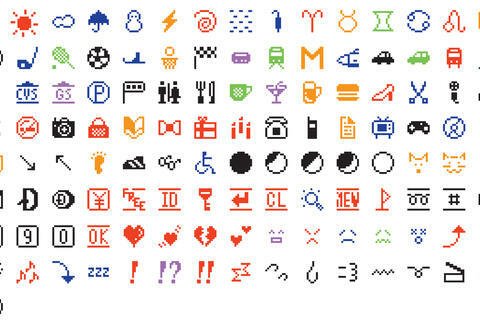 The Museum of Modern Art has acquired the original set of 176 emojis to add to its permanent collection, and they will greet visitors in the museum’s lobby starting in December. The symbols, which were created by Japanese mobile provider NTT DoCoMo in 1999, are a far cry from the detailed smileys, animals, and poop (or is it chocolate ice cream?) that have become central to how we communicate today. They actually more closely resemble hieroglyphs on a roll of papyrus with their bluntly primitive lines and shapes. A middle-school-aged texter might even mistake them for cave paintings. OK, so they’re not exactly ancient. Many modern emojis, such as the fist, hearts, zodiac symbols, and googly eyes, have their roots from this original set. But these were originally invented for businesses to send brief messages on pagers to customers about weather reports or sales -- not to passive-aggressively text your ex or thoroughly confuse your mom who just got an iPhone. Now that the emoji set is included in the MoMA’s permanent collection alongside van Gogh and Monet (who you undoubtedly also incorporate into your daily texts), you could argue that emojis have evolved into one of the most accessible pieces of art, with everyone contributing to their understanding. So, text away; your phone has now become a modern art exhibit. Ciera Velarde is an editorial production assistant at Thrillist who most closely identifies with the dancing red dress girl emoji. Follow her on Instagram.